US officials have warned consumers to avoid using toothpaste made in China after a shipment was found to contain a poisonous chemical used in anti-freeze. The Food and Drug Administration said it could contain diethylene glycol, which has been blamed for the deaths of at least 50 people in Panama last year. The brands affected are usually sold at "bargain" retail outlets, the FDA said. The warning comes amid a series of contamination scandals involving Chinese exports to the Americas. On Thursday, Nicaraguan health authorities seized 40,000 tubes of Chinese-made toothpaste after they were found to contain diethylene glycol (DEG). 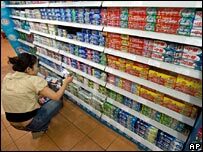 The Dominican Republic, Panama and Costa Rica had already removed thousands of tubes of toothpaste from store shelves. In addition to being used as a coolant, DEG is sometimes used as a low-cost but potentially deadly substitute for glycerine sweetener commonly used in medicines. It was found in the cough syrup and other medicines blamed for last year's deaths in Panama. The FDA issued its alert after its inspectors identified and detained a shipment of toothpaste at the US border, containing about 3% DEG. The agency also found DEG in toothpaste at a distribution centre and a retail store. The labels on the toothpaste found at the retail store did not list DEG as an ingredient. "The FDA is not aware of any US reports of poisonings from toothpaste containing DEG," the alert said. "However, the agency is concerned about potential risks from chronic exposure to DEG and exposure to DEG in certain populations, such as children and individuals with kidney or liver disease." The FDA said DEG in toothpaste had a "low but meaningful risk of toxicity and injury" for such groups.